EU leaders are due to meet in Brussels to discuss further targeted sanctions in response to Russia’s annexation of Crimea from Ukraine. It comes as UN chief Ban Ki-moon visits Russian leaders in Moscow to urge a diplomatic solution to the crisis. 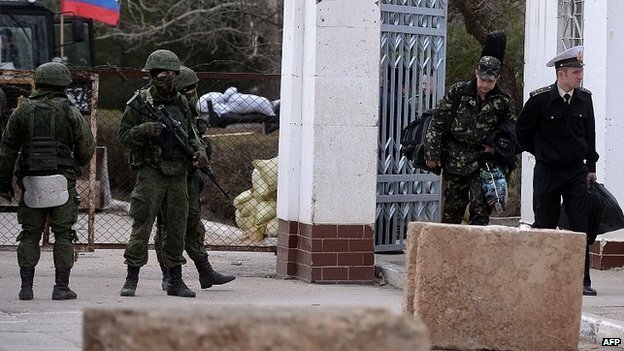 Tensions remain high in Crimea – pro-Russia forces seized two bases on Wednesday, including Ukraine’s navy headquarter in Sevastopol. Ukraine’s navy commander was detained, but has now been released. Crimean leaders signed a treaty with Moscow on Tuesday to absorb the peninsula – an autonomous republic in southern Ukraine – into Russia, following a disputed referendum on Sunday. Russia’s Foreign Minister Sergei Lavrov said the political process was expected to be completed this week, Russia’s Interfax news agency reports. The lower house will vote on ratifying the Crimea treaty on Thursday, and the upper house on Friday. The measure is expected to sail through. Sergei Lavrov said Russia was protecting the rights of Russians, and would continue to “insist their rights and freedoms are observed fully in the countries where [our] compatriots are living”. Thousands of Ukrainian soldiers and sailors remain trapped inside military bases on the peninsula, surrounded by heavily armed pro-Russia forces. Earlier this week, a Ukrainian serviceman and a member of the pro-Russia self-defense force were killed in an incident in Simferopol. The EU, the US and a number of other countries have already imposed sanctions on Russian and Ukrainian individuals. Washington ordered the freezing of assets and travel bans on 11 individuals, while the EU imposed similar sanctions on 21 people. EU leaders are expected to discuss extending their sanctions on Thursday, to possibly include political and military figures close to Russian President Vladimir Putin.